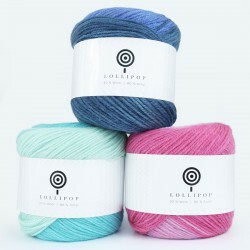 In this category, you will find our most popular yarns for crocheting or knitting a shawl. The shawl is the clothing item that most crocheters and knitters give a go – and it is a really good beginner project. We have a wide variety of patterns and designs for shawls. You can make a shawl in a very simple design or a much more complicated one. Please start by finding inspiration among the many different crochet patterns or knitting patterns for shawls, ponchos and scarves on our site. Common for all the yarns, we recommend for shawls, is that they have incredibly beautiful color transitions which add a unique look to the shawls. 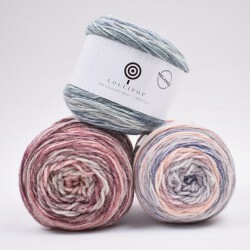 Typically, cake-yarns are used since they are known for being large and round skeins in which the color transition changes from the inside to the outside. 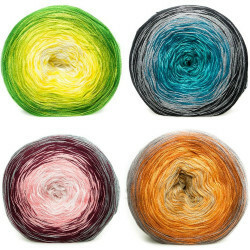 They are available in wool, cotton, acrylic and a combination of these, and they are available in various yarn weights and color combinations. There is something for you who prefer bright colors as well as you who prefer the more soft colors. One thing you have to consider, is the choice of material. If you prefer natural materials, you should choose wool which is known for being a naturally temperature regulating material that can absorb up to 35% moisture without it feeling cold or wet. Do you need to be able to wash your shawl in the washing machine, we recommend cotton and/or acrylic. Acrylic is often praised for being sturdy and extremely durable, and then you can wash it over and over again without it affecting color, shape or longevity. 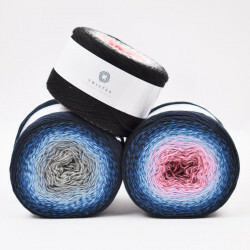 The special yarns we recommend for shawls can, of course, also be used for a ton of other knitting- and crocheting projects. Besides ponchos and scarves, you can also use the yarn for creating a soft blanket for the couch or the stroller, a pretty little baby dress with beautiful color transitions or perhaps a skirt in summer colors. Please remember, you can always find a large selection of patterns on our site. 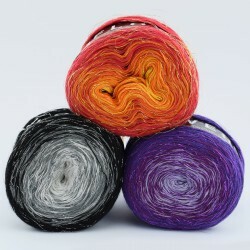 Here at Hobbii.com, we strive to be some of the best and fastest at delivering yarn for shawls and other yarn supplies. Thus, you always receive your goods no later than 3 weekdays after you placed your order online. We take great pride in having a high standard customer service and you can always call us, if you have any questions regarding some of our products. We always provide you with a full refund on goods ordered via our online shop. You are always welcome to contact us, if you have any questions regarding our yarn or need help ordering. You can contact us via our contact form, and we will answer you as quickly as possible. We are looking forward to welcoming you as a customer. So soft,colors run together softly all are workingg so well together. Will make great sweaters for grands.can't say enough The colors flow so well, not a very bright and then a bright, you did very well setting up the color flow of this yarn. Bet it will fast once knitters try this yarn!! Excellent yarn. I bought two of the different blues to make boy/men hats for our homeless community. My friends and I (Crochet Angels of Fairbanks, Alaska) make hats, scarves and mittens and take them to shelters throughout the community. This yarn is soft and keeps everyone warm. I am in love with this yarn. 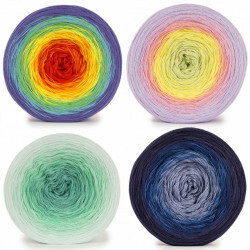 It is amazing quality, no knots, long yardage, and brilliant colors. I will definitely be vuying more! Love this yarn. It is so soft and easy to crochet. The colors flow nicely without abrupt changes. Will probably order again.